Recycle old T-Shirts into bath mats, dog rugs, and more. This project is great for beginners. All you need is a bunch of old t-shirts, shears, and a large crochet hook. Find an old T-shirt with no holes. Be sure it's a tube-type (no seams in in the sides). It should not have thick paint or embroidery. Cut off and put the rest in the rag bag. 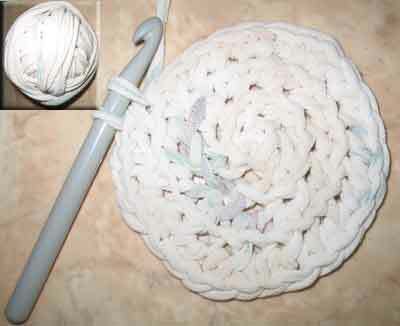 Using chain stitch and single crochet, you can crochet an oval or circle for a hot pad, bath mat, dog rug, or a long strip to stick behind a drafty door. If you're really ambitious, these make great beach blankets or throws for the back seat of the car. I used a size P crochet hook. I chained 5, slipped the hook into the first loop to make a ring, then worked my way around repeating just the pattern of single crochet then a chain stitch so I could expand my circle without my work rolling up. When my coaster was big enough, I cut the thread and worked it into the back of the coaster. It only took about 5 minutes to make a coaster about 4 1/2" in diameter. The only downside to this project is cutting the T-shirts. It takes a whole lot longer to cut the shirts than it does to work them up. The cutting process also produces some lint, so you'll have to vacuum afterwards. Because you'll be using old T-shirts that might have stains, pictures, and writing, the finished product will probably not be a work of art. If you want to make something nicer, look for jersey-type fabric (stretchy) that tries to roll on the bolt. You may have to buy 1/8 of a yard and try it before you buy a large quantity and find out too late that it won't roll up.